In 2006, sociologist and police captain Igor Groshev learned that most of his students had first-hand knowledge of a phenomenon they were supposed to combat as police officers - corruption. 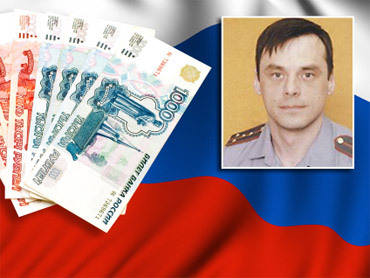 Mr. Groshev, a teacher at the Interior Ministry Law Institute in the city of Tyumen, had conducted a survey to study the extent to which police cadets used bribes to get into that institution or to receive higher grades. "Originally, I was not on any kind of a crusade. I was just doing my job as a scholar and as a teacher of professional ethics to would-be policemen," Mr. Groshev, 42, told CBS News over the phone from his hometown in Siberia. "But when I got the results of the poll, my hair stood on end. The situation was so horrible that I realized I had to report it to my superiors immediately." The sociologist's findings showed that only 3% of those polled had never used bribes to enter the academy or pass exams, while one third admitted to paying between 2,000 and 5,000 dollars in bribes for passing entrance exams without a problem. "And these are the people whose job will be to serve and protect!" Groshev almost shouted on the phone. The bosses' reaction was as sharp as it was bewildering. "Instead of dealing with the problem, they decided to deal with me." Before long, Groshev was "officially reprimanded for conducting the poll," subjected to a line-of-duty investigation and subsequently fired from his job. After the sociologist went public with his findings, the Law Institute took him to court for "harming the professional reputation" of the school - and won. Groshev is still appealing the court verdict in higher instances, but knowledgeable experts in Russia say the sociologist does not have much of a chance. "There is nothing surprising in what happened to Igor Groshev. It is a typical situation in Russia when someone fighting corruption becomes the victim of persecution on the part of the government authorities," Kirill Kabanov, head of the non-governmental National Anti-Corruption Committee told CBS News in a phone interview. "Corruption permeates all levels of life in Russia, the authorities view a corruption fighter as a threat to their personal well-being and prosperity, a threat to the system. So, the reaction of the police academy's management was absolutely predictable - instead of fighting the uncovered problem, they preferred to sweep it under the rug and fire the trouble maker." "The court's reaction is also quite explicable - it supported the police academy because both, the court and the institute, are part of the government and part of the same system. And dog does not eat dog," he added. The academy and the court might have chosen to tone down their attack on the truth-seeking scholar had they known that President Medvedev would soon declare fighting corruption a core element of the Kremlin's domestic policy and launch an all-out war on this social malady. "Corruption should not merely be illegal, it should also be perceived as indecent behavior by society," Medvedev said in one of his video blogs, adding that getting Russians to see corruption as wrong may be "the hardest goal." Igor Groshev is skeptical about President Medvedev's powers to enforce a real fight against corruption in Russia. "His voice is the voice in the wilderness. And sometimes, the public statements that President Medvedev makes even do harm," explains Groshev. "Very often an innocent victim is brought to the altar of yet another campaign, and the malpractice continues as before. Look at my case." Mr. Kabanov, a former secret service officer, echoes this viewpoint. "Although president Medvedev has made fighting corruption one of his top priorities, he will not succeed unless the entire society rises up against corruption. The president may be honestly motivated, but in Russia a single person cannot win the battle against corruption if he fights it alone. Even if he is President." But Igor Groshev believes his case has gone beyond his own or President Medvedev's personal crusade against corruption. "A police force where such a large percentage of officers are corrupt to the core, cannot be expected to be effective," Groshev said in the interview. "What is to be said of a country where ordinary citizens are afraid of policemen more than they are afraid of mobsters?" And the future of such a society appears very grim, Groshev warns. On his website, the sociologist wrote: "Given such attitudes towards the law on the part of the law enforcement and judicial bodies, I honestly fear for the country that we live in! ... I am scared to think what future awaits our children and grandchildren… Aren't you scared?"